Based on the highly acclaimed VIA Apollo P4X266 chipset, the VIA P4X266 VL33-S couples high bandwidth DDR266 SDRAM with the 423-pin IntelR PentiumR 4 processor on a highly expandable and cost-effective ATX form factor. In addition to a high-speed 400MHz Front Side Bus, the VIA P4X266 VL33-S features the high bandwidth V-Link bus between the North and South Bridge of the chipset to further enhance performance. With three onboard 184-pin DIMM sockets, the board can accommodate up to 3GB DDR266 SDRAM, offering data transfer rates as high as 2.1GB per second and providing all the bandwidth necessary for running even the most demanding applications. An ATX size motherboard measuring 30.5cm x 22.5cm, the VIA P4X266 VL33-S provides ample room for expansion with five PCI slots and one AGP4X slot, which supports a full range of 1.5 volt and 3.3 volt AGP graphics cards. Other features include an onboard Realtek AC'97 ALC201A Audio CODEC, a full set of I/O ports, and a dual Ultra ATA 100 IDE connector. 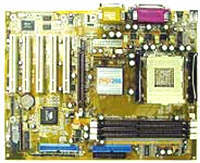 High Performance VIA Apollo P4X266 chipset based ATX motherboard for the 423-pin Intel® Pentium® 4 Processor combining high bandwidth DDR266 SDRAM support with onboard AC'97 Audio.